We purchased 2 of these Ikea variable light bulbs ($26.99) for our bedroom that can be customized for more or less blue light. At bedtime, we have the lights on the least amount of blue light setting. We also use night shift on our iPhones and f.lux (Free) on our computers, but ideally we are not using them. Andrew even created a customized zero-blue light setting in the advanced color settings. We can both click our phones home button three times to activate it after sunset and another three clicks to deactivate it in the morning. Andrew leaves his phone in the living room. I haven’t gotten there yet, but I do put my phone in airplane-mode when I go to sleep. 2) Avoid caffeine 10 hours before bed. Cut out caffeinated coffee, tea, and soda (or just never drink soda) 10 hours before bedtime — and chocolate too (this one is the hardest for me). 3) Prime yourself to fall asleep quickly. Try meditating a half-hour before hitting the bed. 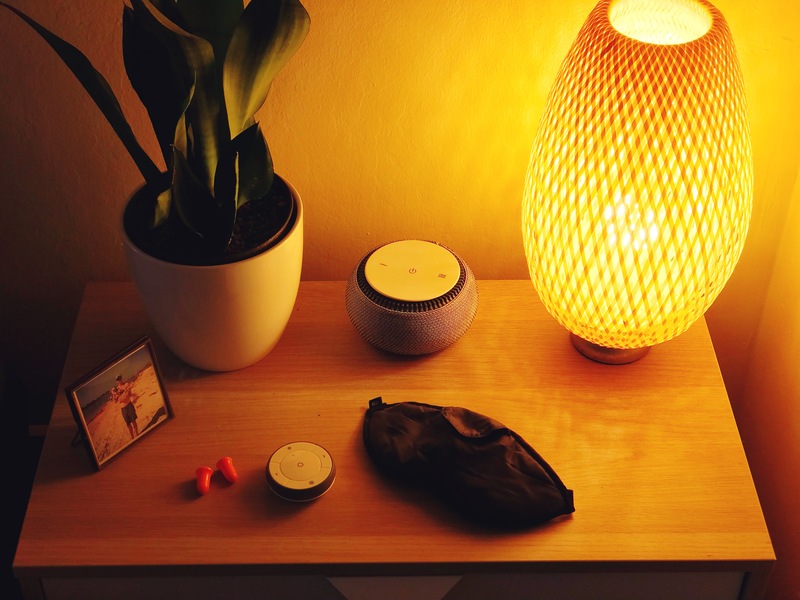 Headspace has a great guided meditation for sleep. It walks you through a short recap of your day and primes you to relax each part of your body one at a time. 4) Aim for 8 hours (at least) of sleep each night. I find that when i am physically very active I need more like 9-10 hours. Each night, the body cycles through 4 stages of sleep with stage 3 and 4 (REM) being where the most important restorative work happens. In a full night’s sleep, the body typically goes through three or four cycles of lighter and deeper sleep, each lasting 60 to 90 minutes. When confronted with less sleep, your brain opts for lighter sleep and hence less REM sleep. Later sleep cycles tend to have longer REM periods than cycles earlier in the night. So, when you sleep through only one or two cycles instead of three or four, your REM sleep is disproportionately affected. 5) Try to go to bed and get up around the same time every day. A more inconsistent routine prevents your body from releasing hormones at the right time to make you feel sleepy and awake, thereby throwing off your circadian rhythm. 6) Make sure the room is quiet (even buzzing from your phone can interrupt your sleep). We just bought the Snooz ($79.99) white noise machine and we love it! It is an actual fan that moves actual air with different pitched fan noise (versus a looped sound track), plus it is a sleek little design. 7) Create a completely dark room. this means zero light! Even the little blue, red, or green lights from electronics that are off and charging should ideally be removed from the room, but at a minimum take a piece of tape and cover it! Get black out curtains. Like I said above, light affects your sleep/awake hormone production. Most people sleep the best between 60-68 degrees Fahrenheit. Find the right temperature for you and make modifications to your bedroom accordingly. We have a heater for the winter and an A/C for the summer. Sure you spend slightly more on electricity, but isn’t your health worth it? 9) Get the right mattress!!! Does it align your spine? I’m a side and back sleeper and I thought I needed a firm mattress for my back (have you all heard similar rumors? ), well it turns out that my former mattress did not support my spine when I was on my back or my side! I’m fairly broad shouldered, so I actually need a pretty soft configuration to allow my shoulders and hips to sink in while my back is supported to put my spine in a neutral alignment. Is it comfortable for both you and your partner? Savvy Rest offers a split mattress that is customizable for both parties. My side is softer than Andrew’s. 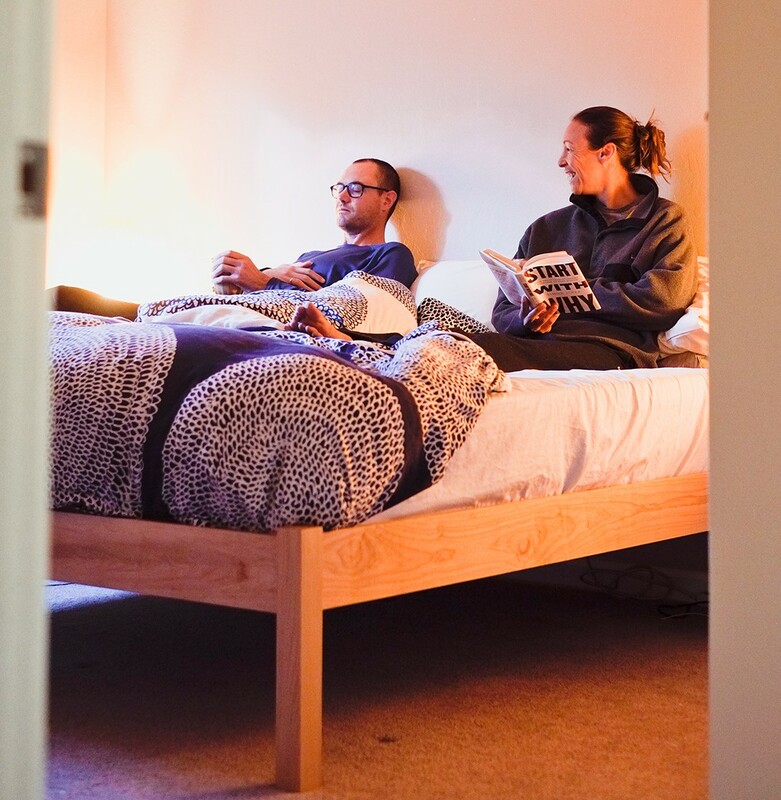 Added bonus – the split mattress limits the amount of movement you can feel when your partner rolls around. Savvy Rest is made of three simple materials: natural latex, organic wool, and organic cotton. And their platform beds are made with maple wood and can be finished with a non-VOC stain, so you can breath easy knowing that your mattress is non giving off toxic-fumes. 9(b) An additional tip for air quality is to adorn your home with these air-purifying plants! Houseplants help rid the home of toxins such as benzene, formaldehyde, carbon dioxide and trichloroethylene, all chemicals that can off-gas from the man-made materials used to build and insulate a home. A NASA study from 1989 recommends 15 to 18 plants in 6 to 8-inch- diameter containers to clean the air in an average 1,800 square foot house. That’s roughly one plant per 100 square feet of floor space. 10) Buy separate comforters! This was another game changer for us that eliminated some unnecessary wake-ups in the middle of the night. The above picture is our Tranquility mattress with a Vitality Topper on an Afton platform with two separate comforters (for two good boys). But in the end, if your sleep suffers one night, don’t fret my friend, your performance will be fine! Your body and mind can perform for a limited time. Just don’t make a habit of it! Thank you and happy sleeping!! Please let me know your thoughts or if you have any additional experiences/sleep tips. Additionally, if there are other areas you’d like me to research and explore in the health and performance realm, I’d love to hear about it! If you are interested in reading further check out the notable Cheri Mah, who researches sleep and performance in elite athletes and has some great articles linked from her Twitter account!